One of the two Bloom Vernon teams, with their principal, Brett Roberts, (left to right) Sofia Mikhaylichenko, Emily Sessor, Haley Williams, Ethan Bloomfield, Roberts, Anthony Salzbrun, Caitlyn McNeal, Baylee Martin, & Jonah Martin. The Scioto County Courthouse was full of lawyers, prosecutors, witnesses, and judges. That may not seem unusual for a courthouse, but these people were high school students from the area. The annual School Mock Trial was in full swing on Friday morning. Schools across the country were holding mock trials on the same day. 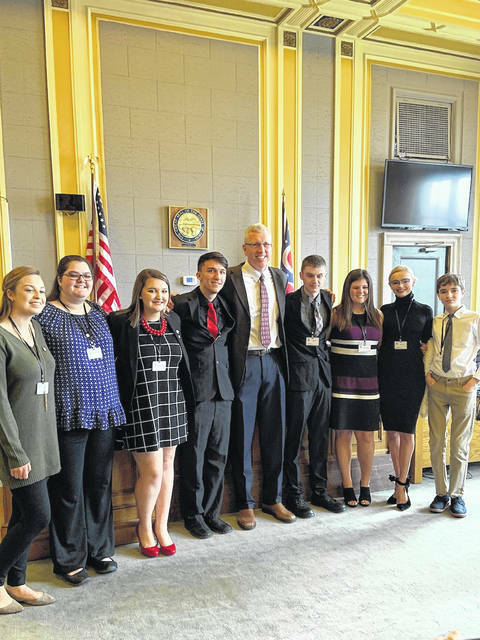 Locally, the District Mock Trial Competition is coordinated by Sharee Price of the South Central Ohio ESC and Judge Howard H. Harcha, III. There were 11 high school teams from eight school districts, that were participating in the competition. Those schools represented were: Notre Dame, Portsmouth, Portsmouth West, River Valley, South Webster, St. Joseph Ironton, Valley and Wheelersburg. It is noted that teams that advance from the District Competition will be able to compete in the Regional Competition on February 15. For this particular trial, Judge Mathew McFarland was the presiding judge. 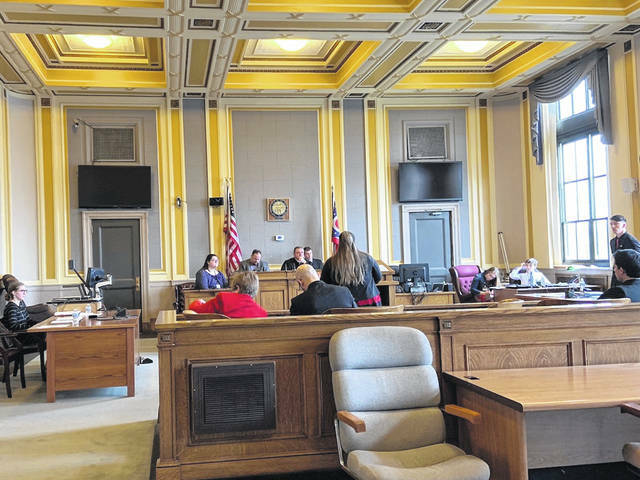 “All of the courtrooms had three judges in them, an actual judge in each one and some are attorneys, but they all volunteer their time for this,” Hykes said. “All of our legal advisors volunteer their time also.” She added the local bar association gets ‘kudos’ from her. During the trial McFarland talked to the students about the rules and what is expected for mock trial. He told them how certain things would be handled in a true court case, compared to what they were able to do in the mock trial situation. Emily Sessor from Bloom Vernon was the expert witness. “It’s kind of exhilarating, because you basically know what you are supposed to say, like what you’re suppose to do, but whenever they get up there and start grilling you like that, as least for me, it fires me up and so it makes me even more like aware of what I’m saying and what I need to do,” Sessor said. She is a senior and has been doing mock trial for four years. The attorney for the Bloom Vernon team was Ethan Bloomfield. Evan Green, a sophomore, was the defense attorney for West and he said that last year he was a witness and then the attorney this year. “I definitely liked being the attorney more.” He said you could tell the first year team members were nervous by their faces, but that they did a good job. He also said by the time they are juniors and seniors, they will have learned what to do and expect.